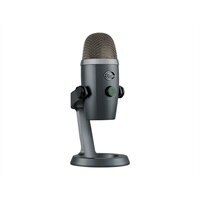 Yeti Nano is a premium USB microphone designed for broadcast-quality podcasting, game streaming, calls and voiceover work. Yeti Nano features 24-bit sound quality, a compact design, and Plug-n-Play operation for instant streaming. The premium finish looks great on camera and on any desktop. Featuring a no-latency headphone output and controls for headphone volume, mic mute and pickup pattern, Yeti Nano is the perfect mic for modern broadcasters.